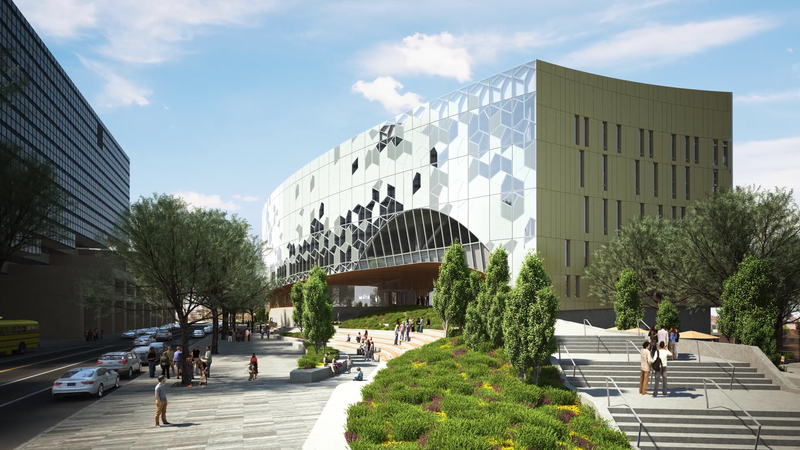 Calgary’s New Central Library will soon be a welcome addition to the East Village, helping to re-connect this vibrant new community with the downtown core. It will certainly stand as a landmark building – an unusual geometric oval shape with a soaring, four-storey atrium – but it will also stand as a testament to innovative design, engineering – and piling. The reason the New Central Library will be one of the city’s more prominent architectural feats lies with the fact that it is being built on a piece of land bisected by an existing LRT line. This necessitated the architects lift the ground plane up and over the LRT tracks and create a raised foundation in the process. No simple task. But fortunately, Calgary Municipal Land Corporation (CMLC) was able to tap into some well-honed experience. Next up was the architectural team, which was comprised of Snohetta and DIALOG. Building up and over the LRT tracks meant that the tracks had to be encapsulated – the first time in Calgary’s history that an active LRT line is being encapsulated to allow for above-grade development. The project will cover 135 metres of LRT track and is covered within the New Central Library’s total $245-million budget. The other twist in the project was that the LRT had to remain operational. Entuitive started on the project in January 2014. The design encapsulation and construction documents were completed in August. The structural engineering firm did, however, begin sequential tendering in September to advance the pile work. The piling work started on the east side of the site. The pre-cast double-tee roof structure is scheduled for installation on top of the pre-formed walls in August 2015. The existing LRT communications and power lines on the north end of the east side of the site posed a bit of a challenge in the encapsulation process. Eighteen piles were driven in the southern end of the east side of the encapsulation project in September 2014. The remaining three piles on the east side went in after the rerouting of the communications lines. Fragachan adds that the tightest corner on the site was about eight metres wide. The encapsulation piling project was divided into two phases. A temporary working platform had to be installed in order to ensure that the rig was stable and would not affect the active LRT. According to Fragachan, the company had an average crew size of between five and seven on site during the piling work on the east side. 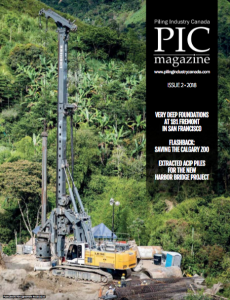 Fragachan and his team completed the piling work on the west side in May of this year. They then had to disassemble the rig and move it to the east side before re-assembling it for work to begin anew. This alone will take three days. The piling rig was moved to the west side of the site in April 2015. This second phase of the encapsulation piling will involve 20 piles in total. Due to the tracks bisecting the site, the piling rig needs to demobilize and remobilize as if the two sites are on opposite sides of town. The rig cannot drive overtop of the LRT tracks. The library itself will require approximately 90 piles measuring between four and five feet in diameter. Washbrook anticipates that mobilization for the library work will begin this summer. The New Central Library is scheduled to open in 2018. When finished, it will have been several years in the making and will have drawn upon the expertise of almost all involved in the project. But it will be a bold and striking embodiment of being able to accomplish the unthinkable – of bringing together two separate physical sites to create a unified whole and, in so doing, connecting two disparate communities to create a stronger city core.